This dream is one of those that I call BIG DREAMS, so it goes without saying that I had to insert it into the first book of FOAL and the Angels ` story. This dream was so very remarkable not only for the deep, deep sense of sacredness that totally overwhelmed me, but also for the incredible vividness of the colors and the accuracy of the most minute details. Do such colors exist on Earth ?? … I wonder. The colors and the sense of Sacred surrounding this spectacular animal, this truly Divine Being made of pure bright gold was a sight to blow your mind away. In the dream, for some reason, I remember` knowing` that this was no superficial veneer of gold, but it was actually made all of pure solid gold, and this seemed to be important. Nonetheless, the movements were so fluid like melted gold, and yet solid. Really have no words in my arsenal to describe this, but believe me, it was an incredible vision. Since there is little more I can add to what I already said in the book, I shall just copy that chapter here. Again let me say that even if I use the name FOAL, this is my very personal experience and exactly, to the very speck , how I saw it in the dream. In the last paragraph I dwell a bit on my fascination with the Divine and yet my running away from it. The beautiful painting is by Andy Boerger, who endeavored so beautifully to make it as close to my dream reality as it could be. Thank you Andy ! It`s been a blessing knowing you ! Foal sees himself in a room sitting at a wooden table with other people . This huge serpent,which is as big as the biggest Anaconda he could ever imagine, at least 30 yards long, is coming at him again and again, as if he has a special interest in him. The color is yellowish brown, with some faint black stripes. Although it doesn’t look as if it wants to hurt him, Foal feels scared and closes his eyes so as not to see. It is so big ! Just the head is bigger than two rugby balls put together. As the snake approaches again from behind, Foal feels the big head resting on his neck, just under his right cheek. Foal can feel its bifurcate tongue, darting in and out and touching his skin on his cheek and neck. Somebody somewhere is saying “ It’s alright”, but he is petrified in fear. Then the scene skips and he sees himself outside running on a big dirt trail . 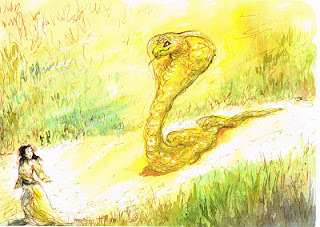 He is on the left side running like mad, and the huge snake is pursuing him several yards back in the middle of the path. Then, all of a sudden, for some unfathomable reason, Foal just feels compelled to stop and look back. His heart skips a beat … what he sees takes his breath away …! he has never, ever seen anything more beautiful! The huge serpent is in the middle of the path and it is all gold, huge and GOLD !! It is all gold, pure shining gold !!! Its cheeks are now all puffed up, rather like a Cobra, and they are reflecting the bright gold rays of the sunshine. From the nose to the puffed-up cheeks there are some dark cobalt stripes, which remind him of the golden mask of Tutankhamen . The serpent is looking right at him, or rather, right into him. His eyes seem to bear holes into Foal`s. Foal cannot take his eyes off the snake. He stands transfixed and he has stopped running. He can see everything, up to the smallest details. He can see the golden muscles rippling under the surface, so strong and supple in their swift bending movement, yet made of solid gold and reflecting the sunlight. He can see the golden hood completely raised and inflated, the eyes exuding and impressing sacredness. The serpent towers over Foal in all his majesty. A KING COBRA . A GOD COBRA. Like one of those Ancient Gods. So incredibly beautiful , so sacred . Foal woke up in an ineffable and liberating stupor. “I think it’s the same theme as for the Stag dream . I am fascinated by the Divine, but I feel so small, awed and overwhelmed by it. After reaching out, I always try to run away, but It comes after me until I am forced to look at It, to acknowledge It. But the Divine is not One to let us go easily and comes after us and begs us to look at It. FOAL, your description is similar to my mystical experiences. So, perhaps the answer is yes, such colors do exist on Earth. In fact, I am sometimes able to predict a mystical experience about to happen, because certain colors suddenly become incredibly vivid. My vision also sharpens, with far more clarity in the small details. The same applies to hearing. It can be a bit overwhelming at the onset. However, once I completely “give in” to the moment, I then become calm, marveling at the wonder of oneness with everything. Interestingly enough, once in a while a particular color will trigger an experience – the last time it was purple. As I sat and reveled in the experience (outdoors on a bench), shades of purple passed by me, mostly clothing pedestrians were wearing. Cobalt blue and various shades of green have also been mystical experience color themes, but never red! I’m never been a fan of it, so that might be why. Many of these experiences happen on darker, overcast days, and also after a rain. I find that on dark, cloudy days the green grass and leaves are so much brighter and vivid. Dana, so good to have you here !! i am so amazed that you can have these mystical experiences while awake. To me, almost all `important` events happen during sleep 🙂 ! but i really understand what you mean by the vividness or alive-ness of colors in those special moments. Everything looks brighter and alive and One, just as you say . i always feel very grateful and humbled when i am granted such kind of experiences! Thank you so much for stopping by and for sharing your beautiful story !! This piece sings of truth; a pure image understandable by even the most pagan among us. I’ve been known to say that “you don’t have to believe in God; He believes in you”. The divine within ourselves pursues us, demanding to be recognized and acknowledged. Gold symbolizes both purity and light; what more could we ask for? How beautifully said !!!! you should write a blog post on these few sentences you just shared here with me. Profound, eloquent, mystical !! Thank you so much for your insightful remarks, Rose !!! Always so appreciated ! I must confess, FOAL, having come face to face with various snakes, including cobras, I had a tough time getting warmed up to this one. Still, I do remember watching what must have been a >20 foot BRILLIANT green snake slowly crossing a road in tropical Africa. For some reason I had the feeling I could go up to it and communicate. I admit, I didn’t. I’m getting from this post that danger is only what we make it. I’ve usually felt that way out in the world, away from people. But I have NO WORDS to describe what I saw when it showed itself in all its golden glory ! I was indeed running away, but had to stop. Trust me, that sort of vision would make stop even you , no doubt !! What you say ` danger is only what we make it.` is so true, all the more so in the Astral where our thoughts and emotions become reflected in whatever we may encounter !! Wow! I just had this same dream. I googled it’s meaning and came to this site. What does it mean? Stacie, hi ! Sorry to be so late in answering (am not much online these days) and so glad you found this place 🙂 ! This was a very special dream to me and that is why I included it in my book. It was supervivid and full of intense emotions. So PLEASE tell me more about your dream, so we can see the similarities and differences, and if you want, we can talk about them. Thank you so much for leaving a comment here ! Hi Bruce, thanks for sharing ! Yes, this kind of dreams just can`t be forgotten. I still don`t understand the full meaning of such an apparition , but it was overwhelmimg and it made a deep impact in my core. To me it felt like looking at the Divine. Such calm and wisdom and profundity I could see and feel in the way it stared at me, like looking deep inside me. Do you remember any feeling associated with your dream? That would be interesting to know and worth investigating 🙂 . Thanks again for taking the time ! It’s the anniversary of my boyfriends death today and last night I dreamt of golden cobras, not one but many of them. All of varying sizes all displaying their hoods but not aggressively. There were other snakes too, all colors. It was incredibly vivid. I was searching for answers and this site is what came up. Any insight would be greatly appreciated. Last night I dreamt about hanging on a big golden cobra head on the wall (same description as you stated up above). Pure gold with 2 vertical black stripes as the cheeks are already puffed up, tutankhamun is what it reminded me as well! Inah, how uncanny is that! wow! i also wonder why so many people are having this kind of Gold Cobra dreams. almost everyday i get hits on this post from people all over the world who seem to have had similar dreams. Hope that the energy in your dream was as good as mine 😉 ! it was one of the most powerfu dreams I ever had.